I designed this fly to imitate a mayfly that hatches occasionally on a few streams around Prince George, BC. I am not sure if this mayfly is indeed from the Genus Paraleptoplebia, the true Mahogany Dun, but due to its very dark reddish-brown coloured abdomen and prominent eyes I am inclined to call it a Mahogany dun. 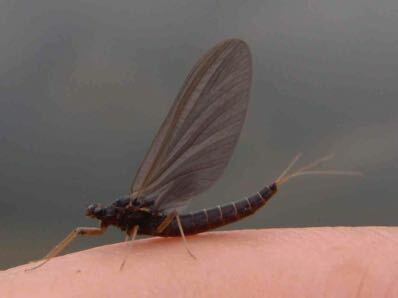 Both trout and mountain whitefish seem to key in on this insect when it does hatch.